This is the first of three reviews for Gill of RealWeegieMidget’s Adoring Angela Lansbury Blogathon which will take place 15-17 February. Brief Synopsis – A handsome young man makes a wish to stay young forever and a portrait painted of him ages while he remains looking the same, but there is a high cost for this. My Take on it – This is a film that I recall watching in 10th Grade English class after we finished reading the Oscar Wilde book it was based on. I didn’t know how to appreciate classic films back then as I can now, yet the film left a lasting impression on me over the past 30 years. This film presents an excellent morality tale that is done so well. They don’t shy away from showing the horrors that someone might be willing to commit in order to retain their youthful presence even at the expense of others. Love the way that the picture itself is in color while the film is in Black and White because the horrific changes on the canvas look even more poignant and effective in full color. The picture itself represents the internal evil that this character manifests within himself in order to stay young looking no matter the high cost to everyone around him. It was great to see Angela Landsbury in this film which was one of her earliest roles. She garnered her second of three career Oscar nomination for Best Supporting Actress for her role in this film. This movie (and the story it is based on) leave a very large impact because of the way that it makes one ponder so much about our own lives in order to think about what is important to us and what we would be willing to sacrifice in order to retain those attributes no matter the cost. Bottom Line – Excellent morality tale that works so well. The story is presented really well on the screen and doesn’t skimp on showing the horrors that someone might commit in order to retain their youthful looks. We get to see how the picture itself represents the internal evil that embodies this characters drive to stay young no matter the cost to everything around him. Great seeing Landsbury in this in one of her earliest roles especially since this was the only one of three roles she was nominated for an Oscar for. This film (and the story it’s based on) leave so much to ponder about our lives and what attributes we would be willing to sacrifice in order to maintain something else. Highly Recommended! Really interesting to read about this as only seen the 1970s remake. Actually 1 of 3 Best Spporting actress nominations for her, but anyway thanks for joining my blogathon with this wonderful tribute. 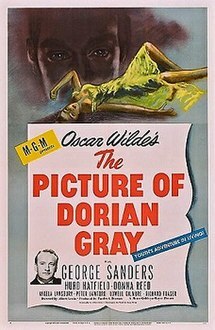 One measure of a truly classic film is the way it stays with the viewer, as The Picture of Dorian Gray stayed with you since High School. Note: Angela’s role here was the second of her three Oscar nominations for Best Supporting Actress. yea, updated that.. my mistake! Yep, a film that stays in ur mind for 30+ years says a lot! Tnx for stopping by and commenting Pat! I really must rewatch this film. I like how to the point you were about your thoughts and how you highlighted the film’s strengths.